Starting from the idea that over the past 40 years the medium of film has evolved from its analogue celluloid-based material form into a digital information entity that co-exists alongside it, I am interested in what happens when the journey is taken in reverse: From a “mental object” that is perhaps merely a unit of memory to a physical object that takes up space and contains time. I plan to create a series composed of 30 to 40 chain-like standardized objects, which will be painted individually and arbitrarily distributed or arranged in a space (horizontally, vertically, on the floor, on a table, leaning on a wall, or as a curtain). These chains of objects – with the working title of „Films“ – will be 30 cm to eight meters long and have a diameter of five to 15 cm. They will probably be made from wood, perhaps bamboo. Smaller versions featuring peanuts also appeal to me. Their individual titles, lengths and paint structures will come from the experimental films I have seen or remember from the archive of the Arsenal. The individual segments will, however, have a discreet but clear label that indicates the original film. I also think it would be productive to be able to take them in one’s hand, perhaps to deconstruct or reconstruct them. 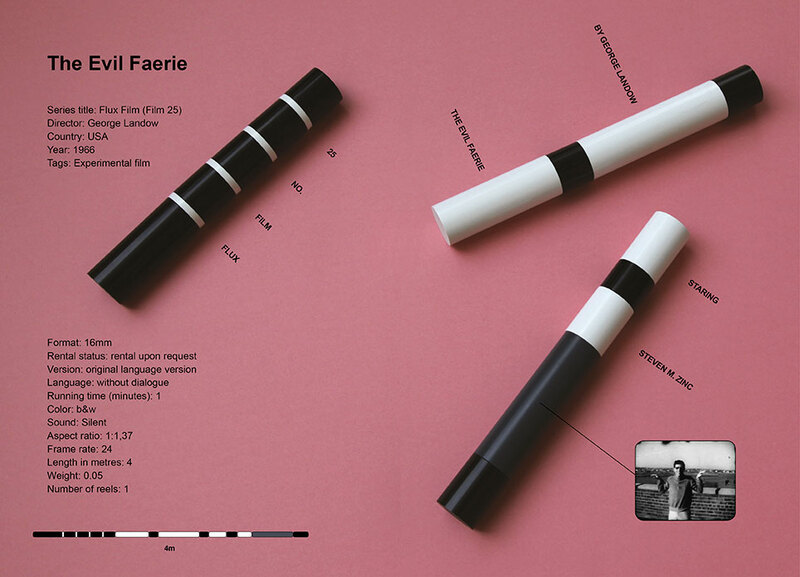 In their graphic form, these objects could become images that find a place in other media such as in a printed book or on a screen, representing single films. The pictorial representation of the medium of film as a colored strip in the „metamedium“ of the computer brings to mind the minimalistic, conceptual wooden objects by the Rumanian artist André Cadere, which he named „Barres de bois rond“ (1970–78). 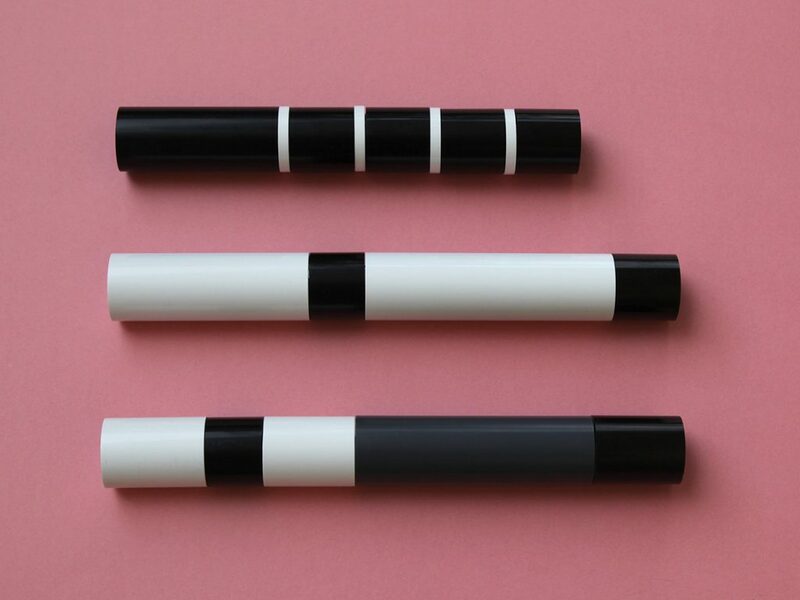 These bars were handmade, painted cylindrical segments arranged according to different mathematical sequences, which each picked up on an inner flaw in the sequence. The objects were seen as a commentary and extension of painting, as a „peinture sans fin“ which had no top or bottom, front or back. Cadere carried them from place to place and their position could be changed. A (film) archive is subject to certain criteria regarding order. Objects are collected, sorted, cataloged, administered. The memory of the contents of the archive and its significance is often, however, of highly subjective kind. Yet there is an attempt to maintain the integrity of the individual film as much as possible and this is especially of interest when complicated copyright questions come into play. The films themselves are wound on reels, labeled film cans are piled up on rows of shelves. A simple cataloging system enables each reel to easily found. The best way of screening a film is under the standardized conditions of the cinema where an audience can experience image and sound events that are organized and saved in a film in linear fashion, in chronological order, from beginning to end. The screen is big, the sound fills the room; a viewer is drawn into the cinema by a poster, a tip in the newspaper or a rumor in the city. When people leave the dark cinema, the sensual and emotional impressions can be seen on their faces, they sometimes move in an uncertain way, try to give words to what they have experienced. Film prints can travel. They are sent by post and they hopefully don’t go missing. With each screening, a new link to the original information saved in the film is created, a new context, a new way of interpreting. Prints can also be destroyed – the simplest way is to cut out individual frames, perhaps for technical reasons. The film archive of the Arsenal also comprises a significant segment with historical experimental films. This is where most of the short films of a non-narrative, experimental nature that were often made in opposition to the products of industrial cinema can be found. Some of the strategies at the basis of these films are very interesting when examining the current problems ensuing from the digitalization of film. For example, the 30-minute long surrealist film made by the US director Joseph Cornell in 1936 ROSE HOBART. Joseph Cornell appropriated a copy of the Hollywood film EAST OF BORNEO that he had found on a flea market. He re-cut it, shortened it and added images, giving it a new soundtrack so as to create a completely new and self-contained piece – a method that radically questions the notion that a film is an untouchable unit of „intellectual property“. This strategy could be described as an early form of „sampling“. Moreover, Cornell also colored the film, which was originally black and white, in blue by screening it through a tinted glass at the first screening. He played sentimental dance music on a record player. For the print that he made decades later with Jonas Mekas for the Anthology Film Archive in New York he decided upon a reddish-purple color and this provisionary or perhaps now final version is also in the Arsenal archive. In this version the soundtrack is an audio cassette or mp3/CD with mambo music from the 1960s that is played in parallel to the film when it is screened (but asynchronically). According to the Arsenal film database, ROSE HOBART is 142 meters long and weighs 0.95 kilos. A second film in the experimental film archive that is interesting to me in this regard is THE EVIL FAERIE by George Landow, aka Owen Land. It is four meters long and weighs 0,05. So it only has 5 percent of the length and weight of ROSE HOBART. It was made in 1966 as part of George Maciunas‘ Fluxfilm initiative and was a Flux Reels work. After a detailed title sequence, the film only shows one single gesture by an actor who remains unknown. This film is purely of an informational nature and only this single gesture, which cannot be clearly deciphered, is imparted. Perhaps, however, this film’s existence is also flawed: Some sources claim that Owen Land refutes authorship and despite general claims and assumptions the film is actually by John Cavanaugh, a US sculptor (who experimented with Flicker films in the early 1960s and is also represented on the Fluxfilm reel). If Judith Hopf and Henrik Oleson copied the exact structure and form of the original in their remake of THE EVIL FAERIE (2008) so as to suggest an alternative reading of the gesture that is a central aspect of the film, they were creating a updating bridge between two films made 42 years apart from each other. Their error or lapse was an integral part of the game. Ephemeral films, flawed films, fragmented films, films without authors, films that were not made for the cinema, films that came about from concrete objection: this practice has now found a platform on the Internet. It is probably no coincidence that many of these experimental films, which are now described as canonical were made at the crossroads between film and the visual arts. The speed of the dissemination of information about the existence and essence of a work increased continuously during the 20th century, culminating with the rapid propagation and internationalization of immaterial, conceptual ideas at the beginning of the 1970s, alongside the development of the micro computer and digital networks. A few years later, the revolutionary, exciting energy of the experimental art-film movement vanished. „Avant-garde“ film found itself in a crisis, it saw itself confronted with unpleasant facts. Fundamental doubts called for an adjustment of originally radical concepts – feminism, performance and the availability of video and its potential for manipulation posed new challenges. This is when, for a short time, the idea of „film without film“ emerged – the film (time) experience was extended beyond „expanded cinema“ and projected onto empty spaces (LONG FILM FOR AMBIENT LIGHT, Anthony McCall, 1975) or on colored screens that faded over a long period of time (YELLOW MOVIES, Tony Conrad, 1972/2009). The examination of the semantic transgression of the borders of significance has turned out to be productive for the visual arts (fountain, pipe). It is interesting to imagine an empty room that is only modulated by light as a „film“. But a piece of screen painted yellow does not yet count as a film according to general criteria and has probably not found its way into an archive for this reason. Preserving, making available and disseminating information about historic, experimental films and their concepts enables a utopian „sub-history“ of film to be written further (Ernst Schmidt Jr. / Hans Scheugl). The fact that this further writing is often combined with a break, a rupture and a re-write is a part of aesthetic field’s capacity for self-regeneration. Once again, the comparison with sampling in music can be made (one could also name DNA sequence analysis as an example). With the objectification of films in connection with the Living Archive project, I would like to indicate the existence of this precarious connection in graphic form. The objects are joined by something common in terms of form that makes them a „set,“ a theoretical entity. They hold certain, individual pieces of information about their length, structure – and even if they are broken into parts or combined anew, they can still be returned to their original form as a single segment, as a real, preserved film. They seem unusual in the context of an examination of audiovisual media. They can also be carried about – they are supposed to be flexible not completely rigid. „Art that does not show change within our time-space of attending to it we tend to regard as ‚object‘. Art that does show change within our time-space of attending to it we tend to regard as ‚event‘. Art that outlives us we tend to regard as ‚eternal‘. What is a issue is that we ourselves are the division that cuts across what is essentially a sliding scale of time-bases. A piece of paper on the wall is as much a duration as the projection of a film. A static thing, in terms of impulses to the brain, is a repetitive event. Whether the locus for consideration is ’static‘ or ‚moving‘, we deal with time-spans of attention, the engagement of cognition and memory within the context of art-behaviour. Neither objects nor events are for the most part accessible. They are rarely ‚on show‘. Since they are intentional, meaningful signs, this is of no consequence: once an idea is established ‚in mind‘, it has entered the circuit of (art) ideas, and it won’t go away, except through debate within that circuit.